The building is a church on Sundays and hired to various organisations in the week. The table-tennis has nothing to do with the church other than it being a wonderful venue for our five tables. Nothing, except in my own mind. Because I have to admit feeling a teeny bit sacrilegious when I first placed our box of nets, bats and balls on the communion table. It’s on the raised area at the front of the church, so it’s natural to use it for administration of the sessions. Practically, if the church wanted to fence it off, they would do so. I grew up in “low” evangelical churches rather than “high” catholic ones and don’t normally think in terms of sacrilege. Where did that feeling come from? I remember years ago as a heavily pregnant lay reader, being in the sanctuary helping at a communion service. I obediently genuflected as required, but couldn’t get back up unless I held onto the altar. I didn’t really believe that women (or worse, pregnant women) contaminated holy things, or that God would mind, yet I felt myself hesitate before gripping the edge and easing myself up. Inclusive Anyone can join in, and they DO join in. 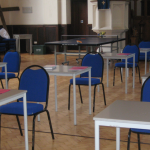 Male and female, young and old, beginners and advanced, UK and non-UK, able-bodied and disabled, any social background. Stretching Table-tennis can be seriously athletic, yet it’s easy for beginners to pick up. So far, players at the over-50s sessions are mostly beginners, but really push themselves to improve each week, with rewarding results. A community All those different people mix and play each other, strong players spend a little time helping weaker ones. Our over-50s sessions aren’t only about being active, but have a social element. Biblical Does it not say in Ezekiel 47:10, “There will be places for spreading nets”, and surely the Bible is full of advice on how to serve and worship-ping? 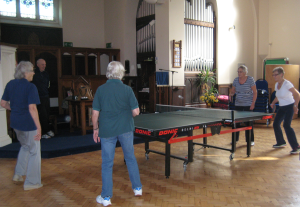 All good reasons for saying ping-pong in church is far from sacrilegious – give or take the last one. More churches should try it!